Fashioned to look like a gigantic piece of luggage, Bon Voyage is a large souvenir store—sort of a supermarket of souvenirs—located near the JR Maihama train station on the walkway between Ikspiari and Tokyo Disneyland. You'll find a good cross-section of merchandise, from hats and t-shirts to watches and clocks to pens and stationery to CDs, videos and toys. As a place to purchase your Tokyo Disney Resort souvenir merchandise, Bon Voyage has several advantages. First is the ability to buy themed merchandise from everywhere in the resort in one location. Another plus is that Bon Voyage stays open one hour after the parks close. If you're not looking for a specific item and just want to pick up some general Resort souvenirs, definitely consider enjoying whichever area of the Resort you're in until closing then come do your shopping here. Another great feature of Bon Voyage is its location, just a few steps from Maihama Station. Being located outside the parks means you don't have to pay admission to shop here. 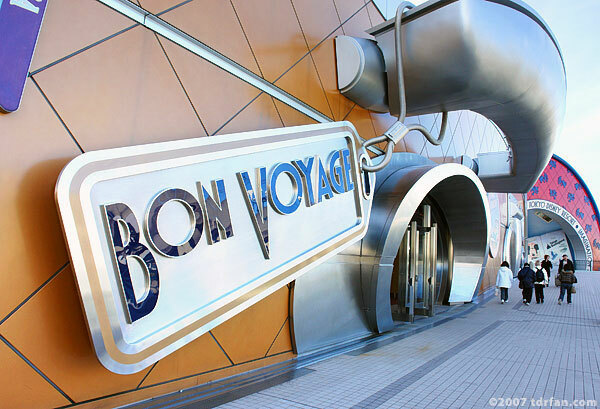 If you've just spent a long day at Tokyo Disneyland or DisneySea and one of those small, crowded souvenir stands near the exit gates looks tempting, I would highly recommend bypassing it and coming to Bon Voyage instead. The store is large and well staffed, so you will enjoy a pleasant shopping experience even when the store is at its busiest.